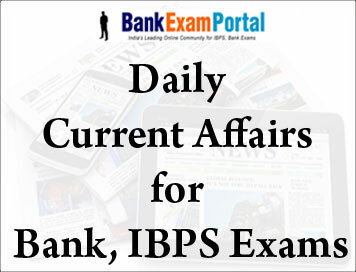 Current Affairs for BANK, IBPS Exams - 17 March 2018 | BANK EXAM PORTAL : IBPS, SBI, PO, Clerk, IPPB, Bank Jobs Aspirants Community. The Union government told the Supreme Court that it will not touch the Ram Sethu, an underwater coral formation in the Indian Ocean referred in mythology Ramayana, for the implementation of the Sethusamudram Ship Channel Project. The government said cutting a route through the Ram Sethu, also known as Adam’s Bridge, would be a cause of “socio-economic disadvantage”. This is part of a one-page affidavit filed by the Shipping Ministry almost four years after the Supreme Court asked the government to “come clean” on the choice of the project’s route and whether it would damage the Ram Sethu. BJP leader Dr. Subramanian Swamy had, as early as 2014, asked the apex court to verify whether a Cabinet decision was taken to “not touch” the Ram Sethu for the project. Mr. Swamy mentioned his plea again before a Bench led by Chief Justice Dipak Misra. Additional Solicitor General Pinky Anand told the court that an affidavit had been filed stating the government’s position. The affidavit said instead of Alignment 6 (the route which cuts through the Ram Sethu), the government would explore an “alternative”. “The government of India intends to explore an alternative to the earlier alignment of Sethusamudram Shipping Canal Project without affecting/damaging the Adam’s Bridge/Ram Sethu in the interest of the nation,” the Ministry affidavit said. In 2016, the apex court granted Mr. Swamy liberty to approach the court if the Centre as much as “touched” the Ram Sethu during the project implementation. Mr. Swamy had requested the court for mandamus to direct the government “to follow any other alternative route or alignment without affecting or destroying or demolishing the historic and sacred place Ram Sethu”. Acting on the suggestions of the Supreme Court, the government appointed a committee under R.K. Pachauri to study whether an alternative route to Alignment 6 was feasible. The court then reserved its judgment until such time the government got Alignment 4A evaluated and a report submitted to it. The committee referred the question of Alignment 4A to the Goa-based National Institute of Oceanography (NIO). Mr. Swamy had alleged that the NIO completed the study and handed over a report to the government in March 2009. He had voiced apprehensions that the report may never be submitted in the Supreme Court as the consequences may be to the scrap the project itself. The court also wanted to know the government’s position on whether the ancient Ram Sethu could be declared a national monument. Hearing a petition alleging that the Chardham highway project was resulting in ‘massive’ felling of trees, the National Green Tribunal (NGT) has urged the project proponent to refrain from doing so till further orders. The green panel on February 28 had issued notices to the Centre and the Uttarakhand government on why the ongoing work on the Chardham highway project should not be stayed. In its reply to the show-cause notice, the State government denied “each and every averment and allegation made in the applications”. The directions came while the tribunal was hearing a plea filed by Dehradun-based NGO Citizens for Green Doon, where it was alleged that the road-widening work to connect Kedarnath, Badrinath, Yamunotri and Gangotri was being carried out in violation of environmental laws. Abolishing Health scheme: Rajasthan Govt. The Bharatiya Janata Party government in Rajasthan is set to abolish a health scheme for the poor, started by the previous Congress regime, on the purported ground of duplication leading to loss to the exchequer. Congress has cried foul and described it as an instance of BJP’s insensitivity. The State government has decided not to extend the Mukhya Mantri BPL Jeevan Raksha Kosh to the financial year 2018-19 after its expiry on March 31. Medical and Health Minister Kali Charan Saraf said that the scheme’s beneficiaries would get free diagnosis and treatment facilities under other plans. According to the official orders, the patients of below poverty line (BPL) category will get the medical treatment under the Bhamashah health insurance scheme, free diagnostic test scheme and free medicine scheme. A new procedure has been laid down for the cases of hospitalisation, implants and specialised treatment. However, the move will render over 500 contractual employees, including the computer operators, unemployed. They were hired for effective implementation of the Mukhya Mantri BPL Jeevan Raksha Kosh in various districts. Besides, it gave a grant to the childless BPL couples and those with an annual income of Rs. 1 lakh for their treatment. Mr. Gehlot said the State government had taken the decision on the pretext of promoting the Bhamashah health insurance scheme. Prime Minister Narendra Modi said Manipur’s woman power and sporting talents have been an inspiration for the Centre in designing programmes such as ‘Khelo India’. He was speaking at a rally after initiating a slew of projects at Luwangshangbam on the outskirts of the State capital, Imphal. The projects included Luwangpokpa Multi Sports Complex, Rani Gaidinliu Park, 1,000 anganwadicentres and 19 residential complexes for teachers, doctors and nurses in far-flung areas. He also inaugurated the boxing academy of Olympic medallist, Mary Kom. Mr. Modi laid the foundation stone of the National Sports University — India’s first — that was caught in a land dispute. But scrapped from the list of projects to be inaugurated by him was a multi-purpose dam project following protests from the Joint Action Committee Against Forced Inauguration of Mapithel Dam, an umbrella body of 20 groups of project-affected people. Born at Nungkao in Manipur’s Tamenglong district, Gaidinliu (1915-1993) was a revolutionary who led an army of Nagas against the British in 1931. Pakistan has failed to take decisive actions against terror groups as sought by the Trump administration, the White House said, and warned Islamabad that the U.S. is prepared to take actions on its own to safeguard its personnel in Afghanistan. U.S. President Donald Trump had announced his South Asia Policy in August last year, criticising Pakistan for providing safe havens to terror groups carrying out attacks in Afghanistan. The Trump Administration, for the first time, has really restored clarity on the U.S.-Pakistan relationship. “We are truly holding Pakistan accountable for its actions,” the official said, adding that the President has made it clear that he is not satisfied with the action taken by Islamabad. “We have communicated clearly to Pakistan what we mean by decisive action,” the official said. On questions about the deadline, the official said the U.S. is in discussion with Pakistan. The U.S. also wants Pakistan to take action against Pakistan-based terrorist groups that target India like Lashkar-e-Taiba and Jaish-e-Mohammed (JeM). Sanctioned Rs.10,000 crore for GST refunds: Govt. So far, the government said, ₹10,000 crore of refunds had been sanctioned by the Central Board of Excise and Customs and the States, although it did not mention the quantum of the remaining amount. “It is a fact that while a number of exporters have not been able to get the export refunds, so far others have been granted refunds,” it added. The current account deficit (CAD) rose to 2% of the GDP or $13.5 billion in the December quarter, up from $8 billion or 1.4% in the year-ago period, on the back of higher trade deficit, according to Reserve Bank of India (RBI) data. The CAD, which shows the difference between foreign exchange earned and spent, stood at $7.2 billion or 1.1% of gross domestic product (GDP) in the preceding September quarter, according to the data released by the central bank. “The widening of the CAD on a year-on-year basis is primarily due to a higher trade deficit which rose to $44.1 billion in the reporting quarter due to a larger increase in merchandise imports relative to exports,” the central bank said in a statement. On a cumulative basis, CAD more than doubled to 1.9% of GDP in the April-December 2017 period from 0.7% in the corresponding period of 2016-17 due to wider trade deficit, which increased to $118.9 billion from $82.7 billion. Net services’ receipts rose 17.8% during the reporting quarter mainly on the back of a rise in net earnings from software services and travel receipts. Private transfer receipts, mainly representing remittances, amounted to $17.6 billion, an increase of 16% from over a year ago. Net FDI inflows during April-December 2017 declined to USD 23.7 billion from USD 30.6 billion, while net portfolio inflows stood at USD 19.8 billion during the period as against a net outflow of USD 3.2 billion a year ago. India is likely to witness an increase in steel imports from South Korea and Japan in the near term due to global readjustment of trade patterns after the U.S. imposed a 25% import tariff on the commodity, rating agency ICRA said in a note. Both South Korea and Japan, which have free trade agreements (FTA) with India, are expected to raise their exports to countries with which they have such pacts, following the move by the U.S. Together, the two countries exported about 5 million tonnes (mt) of steel to the U.S. in calendar 2017. ICRA, however, said the impact of U.S. tariffs may not be significant in the medium term as 26 mt of affected imports to that country would be absorbed by the 25 mt increase in the global demand elsewhere, especially in emerging economies. Also, Chinese steel exports had been declining in the last two years, reaching 75 mt in 2017 from a peak of 112 mt in 2015, providing an opportunity to other countries to fill this gap left by China, by diverting volumes away from the U.S.
Current Affairs is Part of Online Course of IBPS Exams.